Low slope roofing is a different ballgame. It takes training and experience to properly diagnose and devise a plan to repair or replace a flat or low-slope roof. 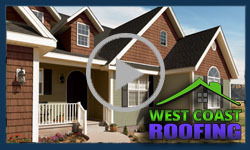 West Coast Roofing in Portland, Oregon has that experience. We offer a full line of roofing products to ensure that your roof is completed right the first time with a system that is designed for your unique project. Our low-slope roof systems utilize the latest technology to reflect the sun's damaging rays back away from your building to not only keep it cooler, but to mitigate the thermal shock (expansion and contraction) that shortens the life of any roof. You can save money on cooling bills, as well as help the environment. Low-Slope patio roofs that are an extension off your shingle roof are especially tricky. West Coast Roofing in Portland offers years of experience to plan your tie-in and execute it properly for a leak-free junction. Call us today to learn more about all of our low-slope roof options.